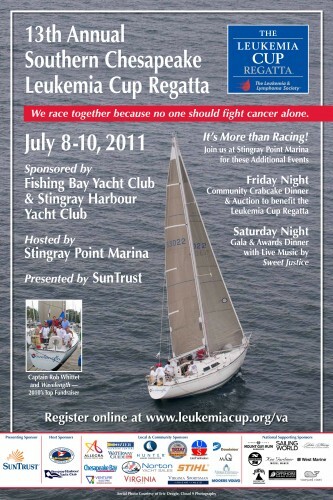 I sailed on Wavelength for the 2010 Southern Bay Leukemia Cup Regatta and not only was our picture featured in a Leukemia Cup Ad in Sailing and Cruising World, but now we’re on the cover of this year’s regatta poster and flier. Wavelength was the top fundraising boat at last years regatta. We’re hoping to repeat and would like to ask anyone who would like to make a donation to the Leukemia and Lymphoma Society to do so via this link. Thank you!